One of the best parts of the holidays is that they bring families together. 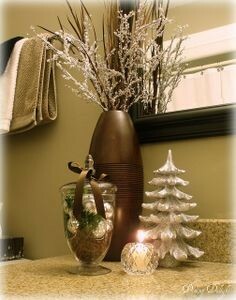 But did you know the guest bathroom is one of the most heavily trafficked rooms of your house during the holidays? If your guest bathroom isn’t exactly in tip top shape, here are six quick and easy bathroom repairs you can easily get done during the rush of the holidays. Before your guests start arriving, really examine the seat on your toilet. Installing a new toilet seat will insure you have a clean looking commode without any loose fittings or cracks. If your previously smooth and pristine caulk is now brown and brittle, it’s time to re-caulk before your mother-in-law has the chance to tsk tsk about it. Check the caulk around your sink, tub and shower joints. If it looks mildewed or even just old and worn out, then head over to your nearest home improvement store for some new caulk. Those stains aren’t permanent. Combine equal amounts of cream of tartar and baking soda with enough lemon juice to make a paste. Rub the mixture into the stain with your fingers or a soft cloth. Let sit for a half hour, then rinse well with water. Voila! No more unsightly stains. Has your current shower head seen better days? Though cleaning it is an option, replacing it may be an easier choice. If you don’t already have one, it’s an opportunity to install a water-saving model. Using a clean towel, rub the spot with liquid dish soap and water. Change out the towels and floor mats for ones with a holiday theme or colors. Plug in a seasonal night light. Add a basket of scented pinecones or a scented candle to keep the air fresh. Getting your home “guest ready” with these quick and easy bathroom repairs will make the holiday season even happier for you and your guests. If your bathroom, or any room in your house, needs more help than you can give it, contact The Chuba Company! The Chuba Company can provide everything from basement finishing, interior projects, three and four season porches to room additions and complete home renovations. We also provide exterior home improvements such as decks, roofing, siding and windows. We excel at giving our clients a high level of attention to detail and place utmost value on the client-contractor relationship.